Home/Resources/Answer Key/KVPY/What after KVPY Stage I Exam 2016? Every year, KVPY Exam is conducted by Indian Institute of Science (IISc) in the month of November. Answer keys are a list of correct answers of the question papers. 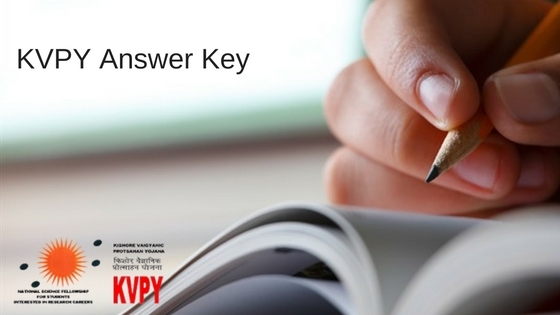 Separate KVPY answer keys will be issued for all the stages and the question paper code. The answer keys and solutions of KVPY 2016 will be issued for all streams– SA, SB and SX. Students can also check the solutions of the KVPY 2016. The official answer keys will be released by Indian Institute of Science (IISc) Bangalore few days after the examination. Candidates who will be appearing in KVPY fellowship exam can check the answer key and match their response with the correct answers. Candidates can verify their response with the issued answer keys to having an estimated score. They can check how many questions they have marked correctly and how many of them are incorrect. This process will help them to know their estimated marks before the declaration of result. If you get well-estimated marks then you can start preparing for the next stage exam. What after KVPY Stage I 2016 Answer Key? After the issuance of KVPY 2016 answer key, results for KVPY scholarships/ fellowships exam will be announced. According to the previous years, it is expected that the KVPY results will be declared in the month of December. After that, IISc Bangalore will conduct the interviews of shortlisted candidates who have qualified in the KVPY aptitude test. Candidates can also request for re-verification of KVPY OMR response sheet that will be issued with the answer keys. For applying, candidates have to send a covering letter indicating the application/seat number and stream, along with a fee of Rs. 1000/- that must be paid in the form of a Demand Draft drawn in favor of Registrar, IISc, Bangalore-12 payable at Bangalore. Further details will be issued along with the official answer keys.